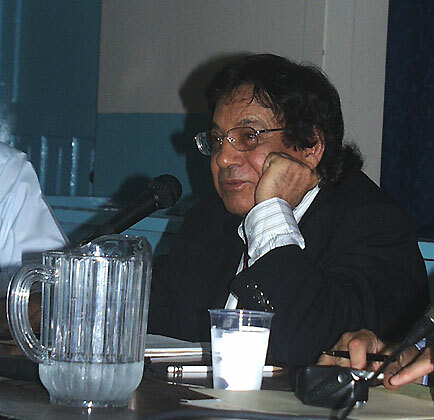 Fernando Manfredo Jr. facing an ACP triple-team and stream of insults during the 2006 canal expansion referndum campaign. History has demonstrated the wisdom of what he said and will continue to do so. Archive photo by Eric Jackson. On December 16 Fernando Manfredo Jr. died at the age of 88, after a long and debilitating illness. He was quite the public citizen, but never saw fit to manufacture and project a public persona. He was an administrator at a time and in a situation where a big part of his job was cutting short the career plans of many and dashing the ambitions of others. He was a good man who served in bad governments and who held a vital part of Panama together in turbulent and infamous times. He was a derided and ignored bearer of prophetic warnings and promoter of a dream that too few of his fellow Panamanians even understood, let alone embraced. No wonder his passing drew such sparse comment from this country’s political parties. In the wake of his passing it has mostly been the nobodies, or ex-nobodies, who have sung his praises. Manfredo was part of the brain trust that General Omar Torrijos — himself a towering national figure with feet of clay — assembled for a great national project that made Panama whole, a single Spanish-speaking country without the two parallel borders of a bisecting foreign enclave. Is it said that the dictatorship used a lot of good people? Those who say that and sincerely know probably have Fernando Manfredo in mind. He was a graduate of the Instituto Nacional in the days when that flagship of the public school system as one of the prime movers of Panamanian nationalism, then educated as a business administrator. As an old friend of Omar Torrijos at the time of the 1968 coup, Manfredo was asked to take a civilian post in the military-led regime and took over as magistrate of the Electoral Tribunal at a time of no meaningful elections but when that institution still performed, as it does today, the vital task of registering and issuing cedulas to Panamanian citizens and legal residents. He went on to be Minister of Commerce and Industry, Minister of the Presidency and a key member of the team that from 1975 to 1977 sat down with the Americans to hammer out the final details of the Torrijos-Carter Treaties. Come treaty implementation time in the fall of 1979, by binational agreement but formally as a Jimmy Carter appointee, Manfredo became deputy administrator of the Panama Canal Commission. US Army Lieutenant General Dennis P. McAuliffe was the administrator and for a decade the two of them, re-appointed by Presidents Ronald Reagan and George HW Bush, oversaw the transition of the canal work force from predominantly American to predominantly Panamanian. The elder Bush decided to invade Panama without bothering to inform McAuliffe beforehand, which led the latter to resign and leave Panama in a huff. That left Manfredo as acting canal administrator. He served both as deputy administrator in the worst of Noriega times and as acting administrator when a personally decent President Guillermo Endara came to power along with a crowd that included too many who thought that the hand of God had intervened to bring about their turn to steal. At or near the top of a canal administration in which the Panamanian percentage of a work force that shrank overall went from 10 to 70 percent, a lot of Zonian resentment was directed at Manfredo. Some Panamanians who felt entitled to pick newly available plums were also deeply disappointed. Less than a year after the invasion Manfredo handed the acting administrator post off to an Endara appointee. Not the fiery orator or popular culture icon, Manfredo was the running mate of Rubén Blades in the 1994 Papa Egoro campaign. He was called back into public service by President Ernesto Pérez Balladares to run the 1998 Universal Congress on the Panama Canal, rendered a bit less than universal due to Toro’s invitation to Taiwan’s president and an ensuing Chinese-led boycott. Also in this period Manfredo became the first prominent Panamanian to warn of the probable consequences of climate change for the Panama Canal and for the nation as a whole. Although as the years have gone by it has become ever harder to deny, climate change denial is still a presence in Panamanian government circles. In 1999 Mireya Moscoso came to the presidency and made Ricardo Martinelli the minister of canal affairs in time for the complete US turnover of the canal administration to Panama. Martinelli quickly instituted an extensive propaganda and information control regime, with the collaboration of the canal administrator of that time, Alberto Alemán Zubieta. While from the earliest days of the Panama Canal Commission successive Panamanian governments had placed many a political operative on the canal’s board of directors, under the Moscoso, Torrijos and Martinelli administrations the board’s population shifted from partisan apparatchiki to representatives of powerful families and business interests, above all the financial sector, construction industry and corporate law firms. In the midst of this unfolding trend came the 2006 canal expansion referendum. This was held under the aegis of the Martín Torrijos administration and the information control regime established by Ricardo Martinelli, who was then out of office. Business administrator Manfredo went for the heart of the proponents’ argument, economic projections that had the United States over a generation exporting virtually all of its industrial production to China yet still having the money to buy an ever more rapidly growing flood of imported things from Asia. Manfredo argued that it was fraudulent to pretend that it’s possible to predict world economic trends over many years in this fashion. He was treated as an old crank. The “no” campaign was all but criminalized. With the connivance of electoral magistrate, tax cheat and later wannabe president Gerardo Solís it was declared “legal” for the government to pour millions of dollars into one side of a referendum campaign. The proposal passed on the strength of the PRD turning out to vote for it, the left voting against it and the great majority of Panamanians staying home. The “yes” campaign’s bogus economic projections were almost immediately shown by events to be such. To compensate tolls were jacked up in a way that drove some of the canal’s customers to other routes. Now the expansion project is behind schedule and en route to the acceptance of substandard work by a consortium that got the locks contracts on a lowball bid aided by then administrator Alberto Alemán Zubieta’s familial conflict of interest. None of the rabiblanco media that took the “yes” campaign’s plentiful money have ever acknowledged the truth of what Manfredo said in 2006. And this reporter? My most memorable experience with Manfredo had him playing a brief but decisive role in a maddening and unnecessary drama at the 1998 Universal Congress on the Panama Canal. The Panama News is a mostly English-language newspaper but it’s published in Panama and is primarily the work of Panamanian citizens. Registration to get credentials for foreign media took place earlier, but the national press was allowed to register on the day the congress opened. Handling that process was this PRD press operative, one Ibeth Vega, who was wont to let her mere University of Panama grad colleagues that she had her journalism degree from Loyola University in New Orleans. Our conversation was in Spanish. She said that I couldn’t get credentials because registration for the foreign press was over. I showed her my Panamanian cedula and told her that The Panama News is a Panamanian publication. It went around and around, one of these classic “no se puede” situations. She tried to brush me off by saying that she doesn’t speak English. This Panagringo is just culturally gringo enough to be imbued with the indelible trait of irrespeto, and knew quite well who Vega is and where she went to school. So I let loose with a torrent of vulgarity — in English. Two colleagues of hers, behind her where she couldn’t see, were doubled over laughing. One of these told me to have a seat and wait, then left the press center. A few minutes later Manfredo came through the door, to be greeted by Vega’s protest about horribly disrespectful I was to her. Manfredo ordered her out of the room. I got my credentials. We can play pointless “what if” games about recent Panamanian history, but what actually happened is that many a Panamanian patriot who stepped forward to honorably serve the nation under not very admirable circumstances was marginalized by a parasitic and arrogant political caste. But the honor roll — and the dishonor roll — live on in the hearts of Panamanians. Like the others on the honor roll, Fernando Manfredo Jr. was neither a superhero nor a saint. But he served our nation well and ought to be spoken of well in histories yet to be published.